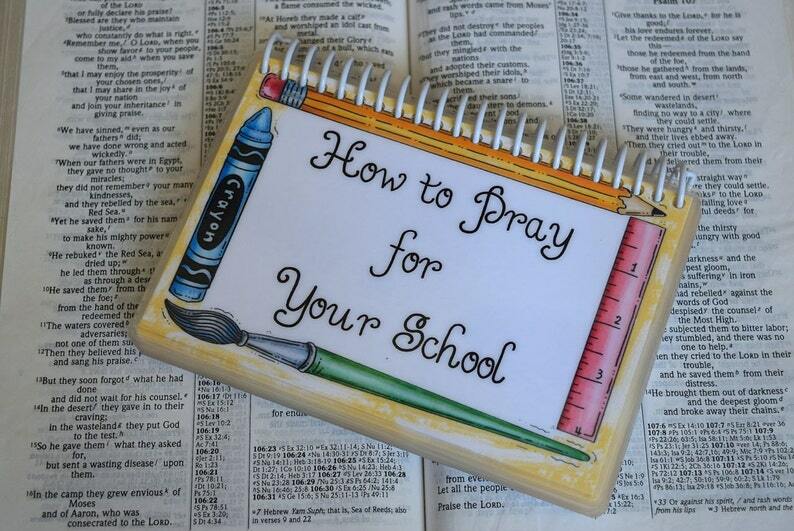 Bless your school with the gift of prayer! Whether public or private, Christian or secular, schools today are in desperate need of prayer! This spiral-bound book will help motivate and direct the prayers of teachers, parents, students, administrators, and anyone with a heart for the education of the next generation. Each of the 15 laminated cards has a different prayer especially for schools, along with a correlating Bible verse. The prayers are derived from a variety of Bible translations including ESV, NASB, and NIV. These prayer cards measure 5 3/4" x 4" and are handmade from top quality materials, including 10 mil laminate. They make perfect Christmas, End-of-the-Year, or just-because gifts for your child's teacher, aide, principal, or PTA members. They can be a wonderful tool for Moms in Prayer or other school prayer groups to use on a regular basis. "How to Pray for Your School" comes nicely packaged - all ready to give away! The cards can also be placed up on a display stand (available here: https://www.etsy.com/listing/86780823/display-stand-for-throne-of-grace) for easy viewing on a desk, shelf, or countertop.